[ey-kuhn-ven-shuh-nl] not observing any conventions. Outside of convention. A blog for everyone and no-one. In encouraging people to think about the shift from courses to resources I have found that the principal mistake is to break (course) content into small chunks and assume that these now constitute resources, by virtue of their format. It can be hard for people to see why this is a mistake at all: after all the results look similar. Both sets of outputs may be short videos, infographics, checklists and guides, for example. 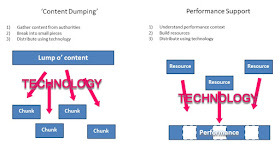 The difference is generally visible in the pattern of consumption: good resources will be ‘pulled’ and used, whilst chunks of course content will still require pushing. And so I see a fair bit of head-scratching ‘we produced three minute videos, but people still aren’t using them’. The answer lies with the process used to construct the media. In the first case, traditional course content is broken into smaller pieces and distributed using technology. In essence though, nothing has changed. The problem is that people aren’t data squirrels - they don’t work by hoarding knowledge, rather they look for guidance when they need it. 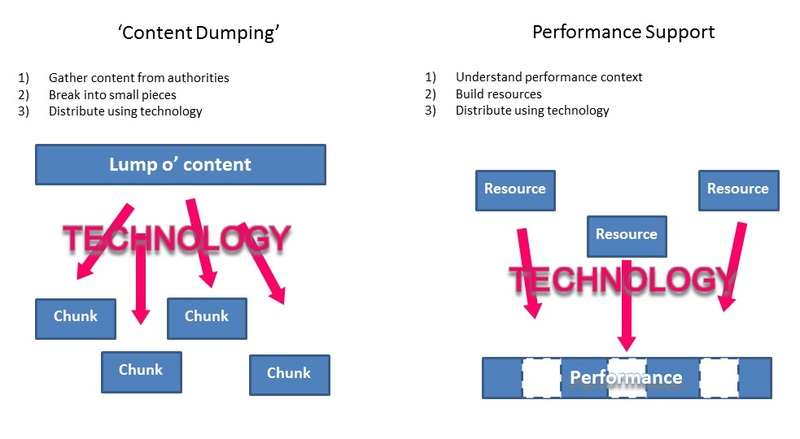 Dumping content on people does not become a good idea by virtue of breaking it into smaller pieces. Instead the focus has to shift from content to context. Specifically, spending time getting to know your audience, their ‘performance context’ and spotting the gaps - i.e. the points in their working day where there is an opportunity for you to help. To redesign the experience. Resources slot neatly into these performance gaps. As usual, the hidden assumption which sets us on the wrong path is that learning is knowledge transfer.